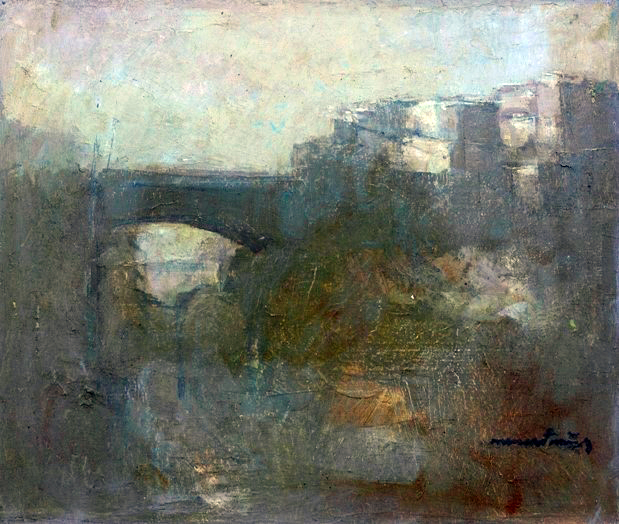 Pakistani contemporary, Mussarat Mirza, is one of the most defining painters of this generation. As a product of Sindh, she has made the province her lifelong study, delving deeper into its unique imperfections with each work created. Her earthy palette coupled with imagery that borders on abstraction entices the viewer to stop in their path in an attempt to understand the work further. Though seemingly minimal at first glance, Mirza’s work is laden with layers of both paint and sentiment. 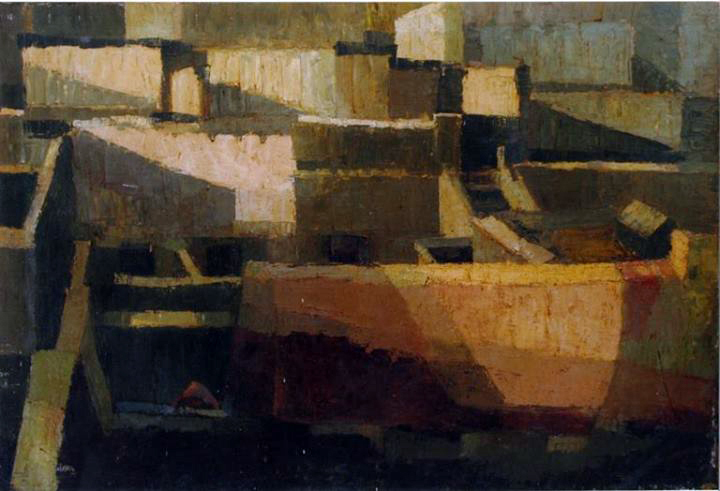 Born in 1939, Mirza grew up in Sukkur and started painting at an early age. Not an obvious choice for a future profession, Mirza was often stirred away from art as a child but it was her father’s receptivity and appreciation for it that encouraged her to keep going. Mirza joined the Lahore College of Women where her skill in the Fine Art Department was soon recognised after which she went on to pursue a Master’s degree from Punjab University where she graduated with honours. Even then, her work reflected the daily life of Sindh, portraying their people and surroundings in melodious compositions. 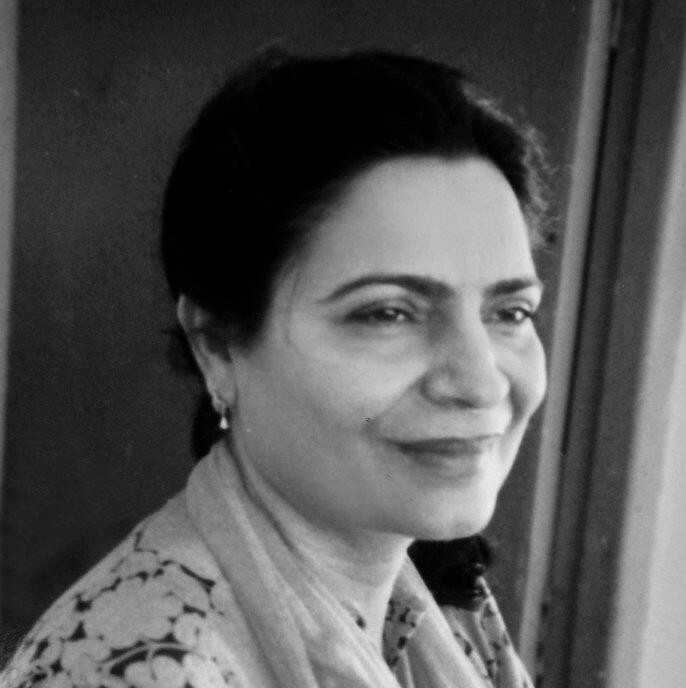 Eventually she began teaching at Sindh University, Jamshoro where, until recently, she headed the Fine Art Department. Mirza has also participated in several shows on both a national and international platform and has had over two-dozen solo exhibitions in Pakistan. She was also the recipient of International Asian Shield, Watercolour from Japan in 1988. Her work and teachings have been so influential that many of her students are known names in contemporary Pakistani Art. After retirement, the artist opened her studio in Sukkur where she continues to paint and teach, privately. Artists such as Aqeel Solangi, credit their early training to Mirza. When looking at the Pakistani talent of today, many of artists originate, not from the metropolises of Lahore or Karachi but from the smaller cities of the country like Hyderabad or Mirpurkhas. Though Mirza comes under the dome of such artists, like many others she did not leave her hometown and take residence in a larger city once her profession took off. In fact, she has been painting and experiencing life away from metropolises and the mainstream art world since the late sixties and this physical distance has strengthened her sense of isolation and introspection. This has proved to be advantageous to Mirza allowing her a link with her rural surroundings to grow and deepen exponentially, as can been seen from her evolution as an artist. 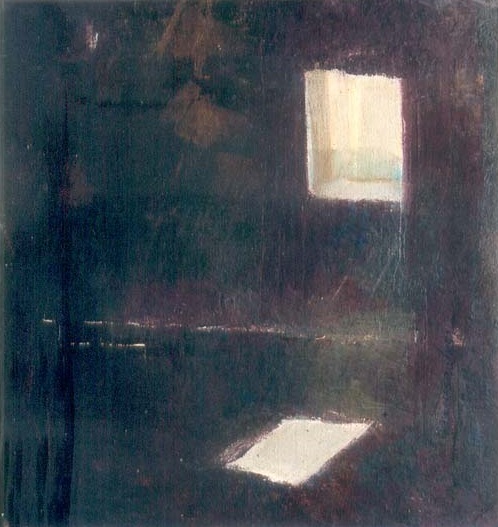 ‘For me painting is an absorbing reality.’ Enthralled by her environs, the artist takes inspiration from the animals, birds, mud houses and desolate lanes around her describing them as ‘similes of (her) expression.’ Even without the pictorial presence of people, her work takes on a mystical essence as she describes her journey as a spiritual one. Her paintings become visuals of self-searching as well as of what is means to be human for herself and for others, what are their thoughts and aspirations and what it means to achieve fulfilment. Interestingly, during the 70s, Mirza moved away from oil and her work became more intimate and graceful through her use of watercolour. Finding an almost instantaneous kinship to the medium, her paintings abandoned the coarse, opaque sensibility of oil and instead presented themselves with delicate and flowing brush strokes. Mirza is a true visual voice for the desert, exploring and deepening her understanding of its colour, texture and daily happenings, and thus providing the art world with something fresh and unalike anything seen in a commercial city. Her seclusion from contemporary art trends has allowed the artwork to evolve at a timely pace with results that can solely be credited to Mirza’s individuality. The minimalism with which she creates, eradicates almost all semblance of locality and time, thereby resulting in a painting adorned with perenniality. The work could quite easily be referring to an event of the past, present or future but its equivocal state allows Mirza to be appreciated universally. The artist uses warm, natural tones creating paintings that seems almost monochromatic as each hue on her canvas effortlessly blends into the next. Lacking in detail, one might not be able to interpret the painting at first glance, overlooking it as mere dissolution of murky colour but Mirza’s work is so much more than that. With innumerable layers of paint on the canvas, the artist explores the true essence of the medium. She forces each layer of paint to battle each other for visibility and thus through the top film of paint, traces of the under-coatings shine through. The use of a palette knife becomes evident from the placement of the paint and then tactical removal of areas after the paint has dried. Time, though absent from the imagery, seems to still be present through the treatment of material. Each work by Mirza shows clear indication of time endured through its working and numerous re-workings as well as its abrasive and strong brush strokes. This also gives off a sense of meditation from the artist which further strengthens the spirituality dwelling in the art. 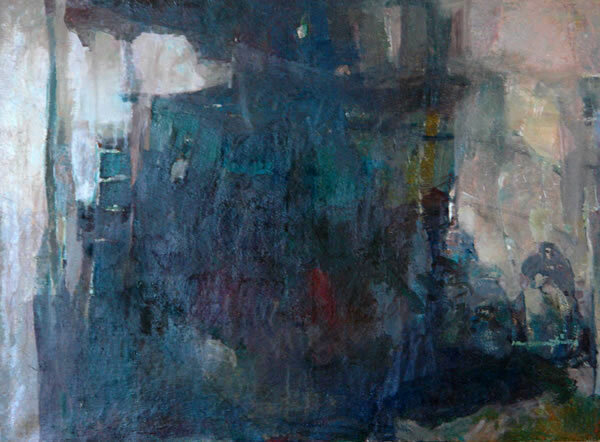 With an unconcern of representation, the artist focuses on achieving the right amount of contrast, shapes and tonal value to give a mere facade of the scene. This in turn permits the paintings to capture feeling, thought and emotion unhindered by mindless detail. Mirza’s brilliant use of contrast grounds the artwork, giving it a sense of gravity, and perspective and creates a beautiful blend with the abstraction of representation that will always exclusively be unique to the artist herself. Artist Statement of Mussarat Mirza.